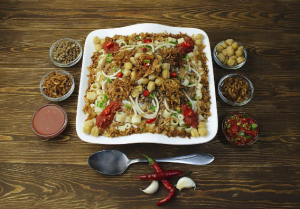 Koshari is so popular among Egyptians that they have hailed it the national dish of Egypt, being enjoyed by generations for over a hundred years. During the nineteenth century, Cairo was a hub for culture and trade, where east meets west. 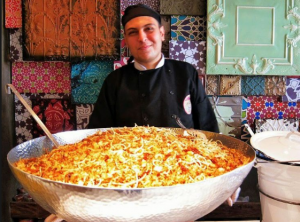 Koshari is a unique dish which came about from the exchange of cultures on the streets of Cairo, as merchants traded thousands of flavors and spices. Koshari is a beautiful culinary display of a combination of flavors reflecting the diversity of Egyptian culture which has arisen over the years, with its rice base originating in the east and the tomato sauce from the west. Who would have thought that such a random combination of ingredients could become so well-loved that one can find it anywhere from four-star restaurants to small street markets and even carts on the roadside? Egyptian families feast on this combination of steamed rice, several kinds of pasta, and lentils served with a topping of tomato sauce and fried onions. Koshari is nutritious and filling, while affordable at the same time. 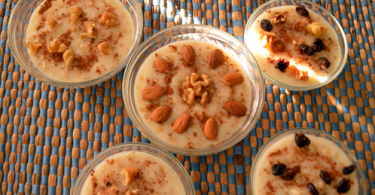 Egyptians make their own variations, serving it hot and ready to eat on the streets of Cairo, the beaches of Alexandria, and the lush banks of the Nile River, where it has made its way into the hearts of the locals. Macaroni is usually the preferred pasta to use for this dish, and the use of legumes tends to vary according to personal preferences which could even be chickpeas or black lentils. The sauce which drowns the layer of pasta is often spiced up a bit with a hint of chili. The browned onions served on top get a sprinkling of garlic, salt and pepper, and even some vinegar. 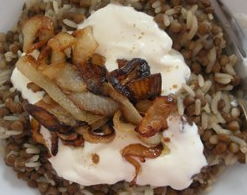 Koshari is a warm dish but is served at any time of the year, no matter the weather. A wholesome meal, koshari was eaten largely by the working class Egyptians in the nineteenth century who needed something nutritious to see them through their long day. Initially, it was only sold on the streets and in markets until restaurants took to serving the increasingly popular dish. 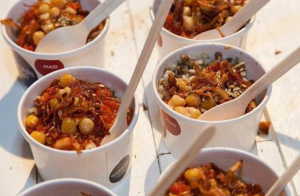 Nowadays a bowl of koshari can go from around ten to twenty-five Egyptian Pounds. All the ingredients are vegetarian and are delicious for anyone to eat. Having no meat whatsoever also makes it suitable for the Coptic Christians to eat during Lent, their religious holiday. Modern Egyptians can enjoy their koshari served with an addition of either chicken or beef if so desired. All it takes is a simple phone call, and koshari will arrive at their doorstep, hot and ready to tuck into straight away. In Cairo it is still sold on the streets in plastic bags from which customers can simply tear away the bottom and devour the koshari, no spoon required! Koshari is particularly convenient for Egyptians who get stuck in the city’s bustling traffic which gets rather hectic. With not much time for stopping to enjoy a meal. Mohammad, a taxi driver, and owner of the Cairo Water Taxi Service says, “The thing that I love about Koshari is it is filling, cheap, quick, and it has great taste.” He loves a good helping of koshari, “Morning, afternoon, night, anytime. I love it,” he mentioned. Experiencing the awe and wonder that is Egypt cannot be complete without grabbing a koshari on the run. Be amazed as you take in the sights and sounds of the land of the pharaohs and add in the adventure of ripping away at a packet of koshari on the streets of Cairo.